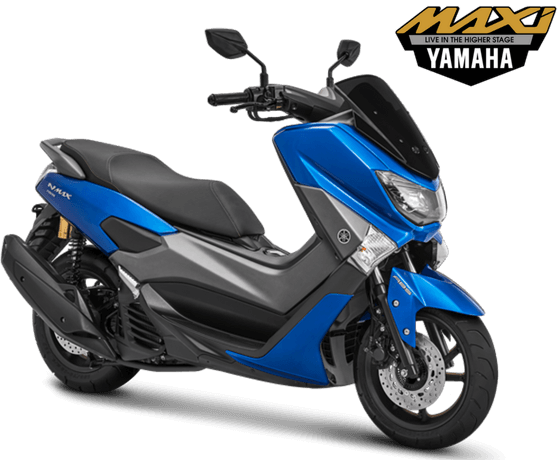 Ahead of the impending release of the 2018 Honda PCX, which now comes in a hybrid version, Yamaha Indonesia has released a mid-model update for the NMax 155, addressing some issues that users have had with this scooter. Coming in both ABS and non-ABS version, the Indonesian market 2018 Yamaha NMax 155 retails for 30.2 million rupiah (RM9,093) for the ABS version, while the sans-ABS model goes for 26.3 million rupiah (RM7,918). New colour choices in 2018 for the NMax 155 with four colour options – matte black with gold wheels, matte grey with grey wheels, blue with black wheels, and white with grey wheels. The matte black and blue paint options are current in Malaysia. Now coming with a two-channel ABS option – something that is not currently offered in Malaysia – the price difference in Indonesia between the ABS and non-ABS equipped NMax is a mere RM1,113. It is hoped that official Malaysian distributors Hong Leong Yamaha will see fit to offer this option to Malaysian riders in the coming year. Other upgrades to the 2018 NMax 155 are Kayaba rear suspension with remote gas reservoir and increased damping oil capacity, said by Yamaha Indonesia to improve stability and increase comfort. Inside the cockpit an LCD with dark background and white numerals, reversing the previous models black on white display. The NMax seat now comes with contrasting stitching and embossed logo. According to reports in Indonesian media, these upgrades can be applied to the previous generation NMax 155. No changes have been made to the powerplant, which is a single-cylinder 155 cc air-cooled unit producing 14.8 hp and 14.4 Nm of torque, fed by EFI. In Malaysia, riders have a choice between the double-disc brake 2017 Yamaha NMax, priced at RM8,812, including GST, and the sportier but single-disc (but with ABS) 2017 Yamaha NVX, also known as the Aerox in other ASEAN markets, at RM10,500. To beat the NmaX, Please bring in your Forza 150 instead of out dated PCX model. Honda pcx150(152c.c. ), road tax RM30, so mahal!! Will they release this model in the philippines? when they will release it in the philippines?? asap.